The series follows the truth that hides within the Village. From the perspective of four young gay adults. Each dealing with their own individual trouble. Whether its being in the closet, dealing with relationships, abuse, identity, self-love, HIV/AIDS, and the harassment that lies with in a homophobic society. Christopher Street never fails to examine the reality of what goes on with today’s younger gay generation. We’re told the DVD installments will hit Amazon.com this summer — and it couldn’t come sooner, with our The L Word fix wearing off. It couldn’t be as bad as Noah’s Ark, could it? Strange name for a series about four young gay people, as young gay people do not, and cannot, afford to live anywhere near Christopher Street. Plus, it’s not even the center of young gay life here anymore. It hasn’t been for quite some time. Hell, even Chelsea is passe these days for the 20-somethings. The should have called it Lorimer Street or Hell’s Kitchen or Inwood. 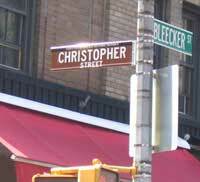 I have several young gay friends who live in–and can apparently afford to live in–the West Village not far from Christopher Street.